If you want to impress your guests with a fabulous yet easy-to-make meal, then Chinese Smoked Pork Ribs will do the trick. This Asian-inspired dish is smokey and zingy, and will have mouths watering in no time! Make the marinade first by placing all of the ingredients into a food processor and whizz until you have a smooth consistency. Place the smoked pork ribs into a large ziplock freezer bag and pour the marinade into the bag. Use your hands to make sure the ribs are entirely coated with the marinade and leave to marinate in the fridge overnight. Preheat the oven to 200°C. Line a large roasting tray with foil and place a roasting rack over it. Place the ribs on the rack, but keep back the marinade. Cook for 30 minutes, and then turn the oven temperature down to 160°C. Cook for another 60 minutes, turning the ribs once or twice to get even colouring. Meanwhile, pour the reserved marinade into a small saucepan and bring it to the boil. Let it simmer until it has reduced and slightly thickened. 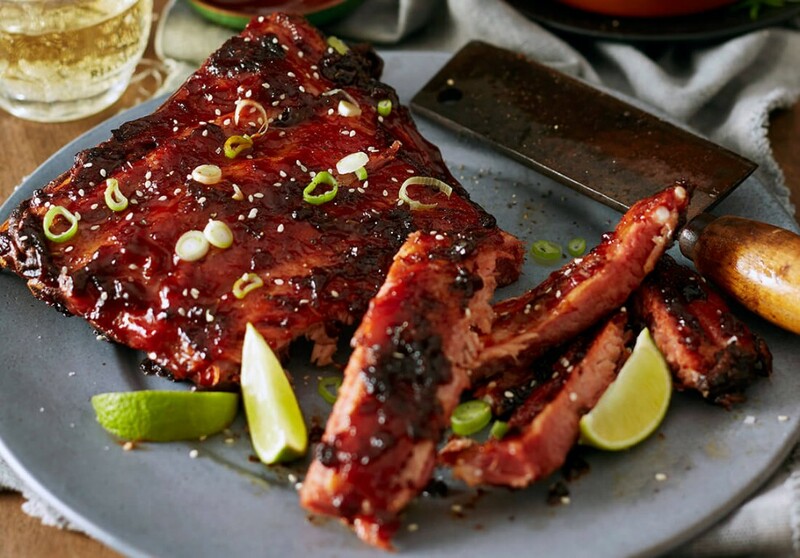 Serve the ribs with the sauce drizzled on top, a sprinkle of sesame seeds and spring onions. Serve with hot potato wedges as an accompaniment.